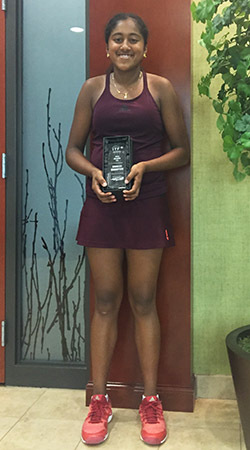 Atlanta, GA: Fourteen-year-old Virginia teen, Natasha Subhash, created history by winning the girls’ singles and doubles titles at the 2015 Atlanta ITF tournament, played on hard courts at the Life Time Athletic at Peachtree Corners. She is the first Indian-origin player to achieve the double feat in an international tennis tournament. Earlier in 2015, Subhash featured in the US Open after getting a wild card entry. She is ranked No. 1 in the Under-14 and Under-16 categories in theUS. Subhash is the daughter of Subhash Kongassery and Sulekha Subhash, who migrated to the US in 1997. 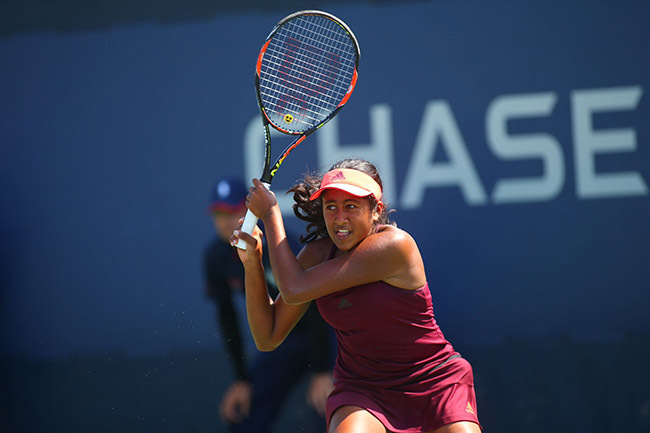 In a conversation with NRI Pulse, Subhash opens up about her journey so far, her experience playing at the US Open, and her goals for the future. What was it like winning the girls’ singles and doubles titles at the 2015 Atlanta ITF tournament? It was amazing! It was my first ITF Singles win, and hence, gave me a lot of confidence. Getting a 2015 US Open wild card entry was a huge milestone. What was your reaction when you heard the news? It was unbelievable! I had not expected a singles wild card although I had done extremely well in the singles and doubles in 2015. So, this was truly a beautiful gift! Tell us about your experience playing at the US Open. What lessons did you take home? I learned to never give up! In the second qualifying match, I got injured in the first set when I was 2-3 down. It was a very painful experience. It took a lot of courage to get back on court and I had only thought of completing the match somehow, initially. But, I ended up scripting an unbelievable win! I was down 4-0 and 5-2 in the second set but never lost the belief that I could win. If I had not held on to that belief, I would have missed out on the amazing experience of playing in the main draw. I got to experience the junior locker room, players’ lounge and met with many tennis professionals. Also, the thrill of competing in front of spectators at the US Open is unforgettable! You are currently ranked 211 in the ITF junior rankings. What does this achievement mean to you? It is a validation of the many years of hard work that I have put in. It proves that perseverance always pays off. How long have you been a ranked player? I was ranked number one in the Girls 12s in theUSA when I was 11 years old. I am currently number one in the Girls 14s and 16s in theUS (in both singles and doubles). At what age did you start playing tennis? When did you, your coach and your family realize that you have exceptional talent in the sport? I started playing tennis when I was four-and-a-half years old. My family and my coaches have always supported me in my endeavor. Our motto is to always strive to be the best that I can be without too much pressure or expectation. Who or what inspired you to take up tennis as a competitive sport? Initially I started playing tennis because I loved the sport. I still do. I am very competitive on the court and that is my nature. I was also lucky to haveFourStarTennisAcademy just a mile from my home. That is where I have been training for the past 10 years. How do you manage school work when you are traveling and training extensively? What sacrifices are needed from you and your parents? I do the best I can to balance my passion for tennis with my desire to study hard and do well academically. It is challenging and does require many sacrifices, such as not being able to do the normal things that teenagers do- going to the mall, hanging out with friends etc. However, my parents and I try to make time for just being around family and friends. I have a group of close friends who I keep in touch with and we try to meet once in a while. When we do, we watch a movie together or just talk and go out for lunch together. Who are your tennis idols and why? Is there any player that you try to emulate? My tennis idols are Djokovic, Federer and I love the fighting spirit of Serena Williams! I would say that I am really inspired by Serena Williams. My goal is to keep improving and be the best that I can be. I am working hard towards that. What do you do to unwind? What are your hobbies? I love reading and listening to music.